Many countries and their leaders are like crabs in boiling water without realising the impending disasters. Sri Lanka is no exception. While the global warming, the pollution of rivers and seas, and the degradation of arable land are continuing, the leaders and their political parties are indulging in confrontational politics without offering or finding solutions to these or other related social problems. What are the other or connected social problems? Increasing income gaps between the rich and the poor, continued extreme poverty worldwide, and neglect of the poor in public policies stand prominent in the world and in Sri Lanka. Let us gather some relative perspectives. The human induced Global Warming Index has increased from 0.2 to 1.0% between 1980 and 2017, compared to 1860 as the base line or zero. This means an increase of five times in less than 40 years. Air pollution index in Colombo is still moderate (89) compared to many other cities. However it is rapidly rising. In Mumbai it is 199. There are serious possibilities of the ecosystem collapsing. The poverty estimates both internationally and in Sri Lanka are distrustful due to political and economic influences. The World Bank and others argue that absolute poverty has decreased during this period, because they want to protect a particular kind of economic policies worldwide which appear to be the basic cause of many of these problems. Poverty is relative and relative to the rich. According to the World Inequality Report (2018) “inequality has increased worldwide despite substantial geographical differences, with the richest 1% twice as wealthy as the poorest 50%”. It is heartening to note that school children in many countries have come forward asking the ‘old’ and the political leaders to protect the environment. 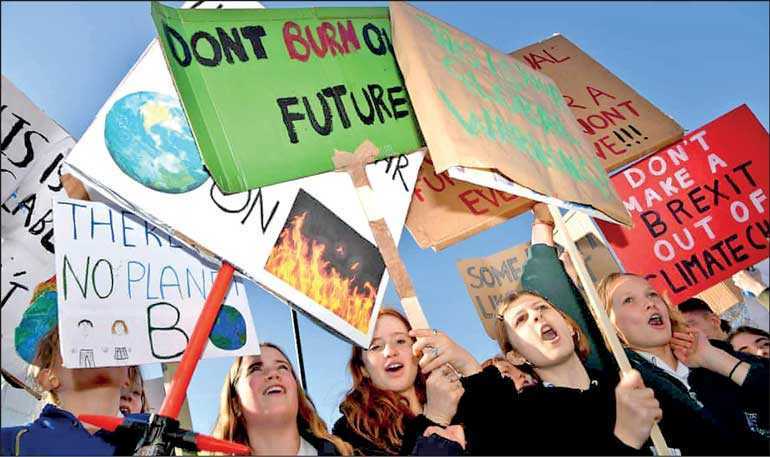 ‘Don’t burn our future’ is one of their slogans. This is in contrast to the elected MPs in many parliaments who are inactive or sceptical about the problem. This month showed thousands and thousands of school children in the UK come out of their classes to protest peacefully. This is something that even Sri Lankan school students could resort to. They may not have the vote yet, but they have a voice to express. They also could combine their voices against global warming with their concerns about poverty in the country. Democratisation of the economy could be a slogan. Children are the best to understand humanitarian issues where the old generations have failed. Confrontational politics have become a global menace. The trade war between the US and China is threatening the world economy with disastrous consequences. Australia is also caught up unnecessarily in between. While the world economy is already not going in the right direction, if there is another recession there could be disastrous implications for both the poor and the rich. Climate change will be further neglected. Talks between the leaders are not sufficient. Solutions are the most important. If there are concerns about ‘technology theft’ those should be sorted out. However, the claims or accusations should not be levelled against each other without evidence. Why not countries share and exchange technology without inhibition to serve the global people? There are many slogans about the globe or the global. But when it comes to the ‘global poor,’ they are roundly neglected. The President and the Congress in the US are at loggerheads without being able to sort out a question of a border wall. Such a wall is already there in some parts of the border. Who built that wall? Strong walls are not good between countries. However, one should not oppose policies, just because the other is proposing. As a result of the conflict, there was a ‘government shutdown’ and nearly a million of workers were without their pay cheques for over a month. The oldest Parliament in the world in UK is in chaos without being able to agree upon a deal to leave their EU partners. The Prime Minister and the Leader of the Opposition are at loggerheads. This has been dragging on now for over three months. In the meanwhile, the European Council President has ‘condemned the Brexiteers to hell’! That is how they conduct negotiations. There is no agreement or consensus within political parties on the issue. They are not discussing matters in Parliament but shouting at each other. Some disgruntled MPs have resign from both Labour and the Conservative Parties to be independent MPs. This is a new trend going on in Australia as well. The above are only some instances of confrontational politics hampering the respective countries and the world at large. More violent confrontations can be seen on the issues of the Israel-Palestine question, the Middle East in general, and now on the question of Venezuela, etc. Although the people have hoped for a new era in Sri Lanka after the January 2015 change, that has not happened or not happened as hoped. It is true that all reasons cannot be attributed to confrontational politics. But most of them are related to power and other confrontations at the leadership level, political party level, community level or even grassroots level of the people. People’s mindsets are also confrontational given the existing political culture and social ethos. It is true that Sri Lanka is still a poor country, the debt burden is high, most of the infrastructural conditions are underdeveloped and there are adverse international influences. The latter however is largely a part of what we have identified as confrontational politics at the international level. 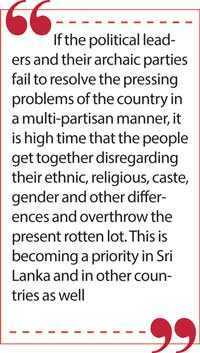 To outline some of the confrontations that hamper Sri Lanka’s progress, the breakdown of communication between the President and the Prime Minister stand as the most crucial and tragic. The national government that was formed had terribly failed to develop bipartisan approaches to resolve the country’s economic, constitutional, ethnic and foreign policy problems to name the most crucial. All talk about ‘democracy,’ but not democracy in the economy. Although the 19th Amendment managed to obtain a near unanimity in Parliament, the current developments reveal that it was an illusion. Either the present confrontations are due to the differences between the law and practice, or the MPs supporting that Amendment without much commitment or awareness. This is not a question about the MPs alone, but about the President himself. An independent assessment also shows that there has been some constitutional cheating behind the 19th Amendment. Therefore, it is no surprise why the Government failed to forge necessary consensus for a new constitution. Most dramatic was the change of President’s apparent allegiance from the UNF government to the Joint Opposition in October 2018. JO was not the official opposition at that time, but the actual opposition which was denied its due status. That was part of confrontational politics and denial of democracy. If the President had decided to be above the confrontations between the government and the opposition, and dissolved the Parliament on that basis, there was much rationale in it whatever the 19th Amendment says about the possibility. Because a major deviation from democracy on the part of the UNF Government has been not holding elections in due time. During the last four years, the Government has largely exhausted its potential. The inclusion of a fixed term in the 19th Amendment without people’s knowledge or consent also appears some cheating. It is still not too late for the President to play a mediating role in promoting multi-partisan approaches in politics, if he is willing and committed. There is much merit or novelty in what Champika Ranawaka has advocated as ‘scientific governance’. It is still not clear what he has fully meant by it. There is no clear proposal for it yet. However, the sounding of it is attractive and the general line of thinking may be appreciated. Perhaps he is asking the Government to utilise more and more science and technology in the administration of Government or governance. However, as he has invited the TNA or the TNA MP, Sumanthiran to join the Government, it has more merit. It is important that this invitation has come from the JHU. The question is, why he was too late in this invitation? Ranawaka relates this invitation to the necessary development work in the north. However, this invitation or the cooperation of the northern Tamil parties are important in resolving the most excruciating national questions of the country. The need for a new constitution also hinges on this matter. This is also part of what I am talking about as the need for multi-partisan approaches in resolving problems. Can politics be considered a science? At present the claim is limited to the study of politics, yet with enormous deformities. Most deformities come from ‘political scientists’ themselves being part of partisan struggles or affiliations. I am not referring to necessary policy or political advocacy. At present, politics is more of a power struggle. Changing that ‘power’ component from politics is not an easy task. Promotion of multi-partisan approaches in resolving urgent and pressing problems can be a start. It is too ideal to think that the present day politicians would forget their animosities and work on completely multi-partisan manner on all issues in the future. However, it is worth forcing them to do so. Some of the immediate issues that they could resolve on that basis are: (1) holding of elections for provincial councils without delay, (2) resolving the disputes over the Constitutional Council and Independent Commissions and (3) the questions related to the abolition of the executive presidential system. If they can agree upon holding parliamentary elections without much delay, it might be the best for the country. If the political leaders and their archaic parties fail to resolve the pressing problems of the country in a multi-partisan manner, it is high time that the people get together disregarding their ethnic, religious, caste, gender and other differences and overthrow the present rotten lot. This is becoming a priority in Sri Lanka and in other countries as well.